Well, we can finally lay to rest the lie perpetuated by the establishment as well as the liberals in the mainstream media who are rushing out to say that Sarah Palin has lost her edge. Since the release of her latest e-mails, the craziness among the usual suspects on the left has already begun. This time though they got caught with their pants down faster than Anthony Weiner. What is it about an attractive, smart, and accomplished woman who has a handsome husband along with five beautiful children miraculously created under one wedlock that drives some of those in the media absolutely insane? Luckily, David Weigel over at Slate corrected the record. 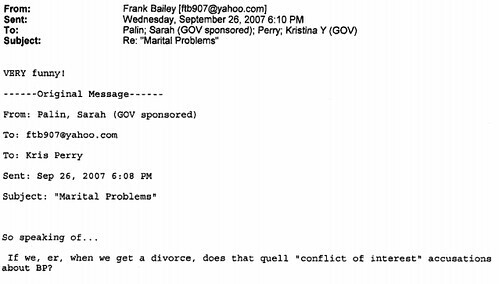 Five years after the e-mail was sent, the Palins remain married. In 2010 and 2011, they knocked aside rumors that they were divorcing. Occam’s razor: Palin really was joking, although the joke was colored by a previously-reported fatigue of working in Juneau far from her family. And the aide, Frank Bailey — the author of a 2011 Palin tell-all, where he could have reported this stuff — got the joke. So, remember folks. It’s never a good thing to “jump to conclusions” in the case of Malik Hasan who sprays bullets into more than 40 of our finest men and women in uniform at Fort Hood. But if you happen to be a member of the mainstream media, its perfectly acceptable to do so as long as your subject is Sarah Palin. But of course — as has been the case before — it can sometimes come back to bite ya.